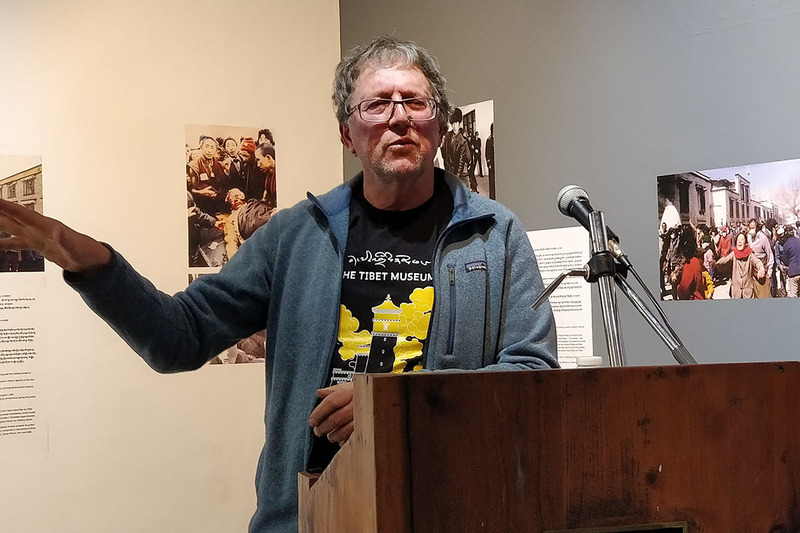 Michael Buckley, author of Meltdown in Tibet, speaks during a presentation on World Water Day, at Tibet Museum in McLeod Ganj, India, on 22 March 2019. Tibetans have always had the concept of sacred land — mountain peaks, valleys, and lakes. For millennia, they have been the objects of Tibetan pilgrims on a quest to complete a walking circuit, or kora, of the sacred mountain or lake. These areas were not called “national parks” or “nature reserves”, but they were effectively the same in that they were to be totally untouched. Michael Buckley, a Tibet specialist and environmentalist, and author of Meltdown in Tibet, has warned of the looming ecological and environmental catastrophe due to climate change, mining and dam-building in Tibet, which will affect the lives of billions of people. On World Water Day on Friday, he gave a talk at the Tibet Museum in McLeod Ganj, India, about the rapidly deteriorating environmental situation on the Tibetan plateau. Buckley presented some disturbing questions: Why is it a danger to blindly exhaust available resources? How does this contribute to climate change? Why are the Himalayan glaciers melting so rapidly? Why will China’s dam-building cause more problems than it solves? Rapid industrialisation in the past has been the major source of global warming. With an increase in global temperatures, glaciers on the Tibetan plateau are now melting faster. Buckley said this will lead to a rise in sea level, with a direct impact on those living in low-lying areas as coastal areas flood. These glaciers feed rivers that provide water for people, not only in Tibet, but to all the large areas below it in Asia, which contain more than a third of the planet’s population. Of the world’s ten rivers that are at most risk of environmental destruction by human activity, five are sourced on the Tibetan plateau. Buckley said that China is exploiting the natural resources of Tibet on a massive scale, through mining and dam building. Tibet has huge reserves of copper, lithium, gold, and silver. Most of it has never been touched, because the Tibetans didn’t mine the land — it is against their religious practices to disturb the ground. China’s intense mining activity has the potential to have severely adverse effects on the environment. It is resulting in loss of biodiversity, erosion of the soil, and contamination of surface water, ground water, and soil. Mining is one of the major emitters of greenhouse gases. The fossil energy resources that it produces also significantly contribute to global CO2 emissions. In opening the Tibetan grasslands for mining, China often expels Tibetan nomads from their ancestral lands and homes. To generate hydropower for its own population, China has built dams on its rivers on an unprecedented scale, and already counts more dams within its borders than in the rest of the world combined. There are estimated to be over 50,000 large dams worldwide, and almost half that number are within China’s borders. Over 23,000 large dams are under operation in China today, and there is at least one dam on every major river in Tibet. “China is building dams like there’s no tomorrow. It is far and away the world’s first builder of mega-dams, and mega-dams can potentially trigger ecological havoc on a huge scale,” Buckley said. The resulting reservoirs of these dams displace entire communities, flood and fragment ecosystems, increase water-borne diseases, and could trigger earthquakes. The dams are creating environmental chaos by disrupting fish migration and sediment flow and degrading water quality. They are also taking a huge toll on China’s biodiversity, causing fisheries to suffer and driving species such as the Yangtze River Dolphin to extinction. Each dam itself poses a significant safety hazard as the structure ages. China has already paid a huge price in human lives for these dams, with more than 20 million people displaced and 300,000 people killed from dam breaks. Scientists believe that the Zipingpu Dam was the likely cause of the devastating earthquake in Sichuan of 2008. Despite all these irreversible problems, the Chinese government plans to approve more mega-dam projects in Tibet in the years to come. As well as extensively damming its own and Tibet’s rivers, China is building large dams on the same rivers downstream in Pakistan, Nepal, Burma, Laos, and Cambodia. In some cases — Burma and Laos particularly — the intent is to export the power generated back to China. These projects are done with total disregard for any cost to the environment, to the people along the rivers involved, and to the impact on the lands and peoples downstream. The degradation of the Mekong Delta in Vietnam is an example of the damage caused in downstream countries due to the sediments supply cut off by damming upstream. Along with the sinking and shrinking of the delta itself, there have been severe droughts, and it is projected that the supply of underground water will be reduced by more than half by the end of the century. This destruction of the region’s environment has been happening with little scrutiny until now. Buckley concluded his talk by asking: Why is China building so many large dams on the Tibetan plateau? The large dams in Tibet — who are they for? Destruction of nature and natural resources results from ignorance, greed and lack of respect for the earth’s living beings. Our ancestors viewed the earth as rich and bountiful, which it is. Many people in the past also saw nature as inexhaustibly sustainable, which we now know is the case only if we care for it.